In recognition of immense contribution to national development, Azaiki Foundation recently honoured a distinguished Professor of Chemistry, Prof (Mrs.) Ayebaemi Ibuteme Spiff. 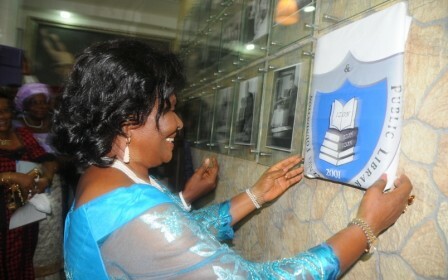 It was indeed a great moment of celebration at the Azaiki Public Library, venue of the event, where a Public Lecture was held in honour of the renounded Prof. to mark her 71th birthday ceremony on April 10, 2014 in Yenagoa Bayelsa State, Nigeria. Prof. Ibuteme Spiff, the first female from the Eastern Nigeria to obtain a Doctorate degree in Chemistry and the first female Professor of Chemistry in the Niger Delta and also an award recipient of the prestigious 50 Women of Honuor at the Nigeria @ 50 Celebration was full of gratitude to the Azaiki Foundation and Public Library and Nigerians at large for the love, honor and outstanding recognition accorded to her. The award recipient and celebrant heartly congratulated the President of Azaiki Foundation and Public Library, Prof. Steve Azaiki for his excellent contributions towards national development and urged every Nigerian to work towards the growth and development of the country as well as the promotion of peace and national unity. Present at the occasion in honor of the renounced Professor where some illustrious sons and daugthers of the ‘IZON Nation’ of the Niger Delta: The husband of the award recipient; Dr. Edward Dandeson Spiff, former Executive Governor of Bayelsa State; Chief DSP Alamieyeseigha, Deputy Governor of Bayelsa; Real Admiral Gboribiogha John Jonah Rtd., Secretary to Bayelsa State Government; Prof. Edmund Allison-Oguru, Commissioner for Information and Orientation; Hon. Markson Fefegha, Prof.Donabebe Wankasi, Dr Grace Koroye, Dr Stephen Olali and other well wishers. In a closing remark, Prof. Steve Azaiki on behalf of the Foundation congratulated the celebrant and also appreciated the guest for honouring the Okpoma girl who became the standard bearer for the Ijaw woman education and a distinguished Professor.